Over the course of the last decade, there’s been ample evidence to support the idea that chronic stress plays a contributing role in a variety of medical conditions in humans. 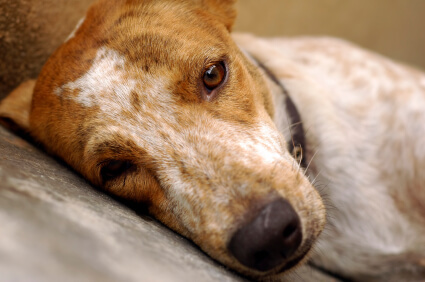 It may come as no surprise that researchers have similarly determined that long-term stress can be a factor in the medical and compulsive disorders of companion animals. Conditions such as feline lower urinary tract disease, inflammatory bowel syndrome, obesity, gastric dilatation volvulus (bloat), noise phobias and separation anxiety have all been found to have a chronic stress component in both dogs and cats (Luescher, 2003). Even so, compared to humans, relatively little research has been published regarding stress and its effects on companion animals. Does your dog exhibit symptoms of stress? Did you know that massage can help melt away woes? Best of all, pet massage is a snap. Just in time to take the stress out of the holidays, Dr. Sarah is ready to lend a helping hand – or two! In this episode of Pet Talk, Dr. Sarah shares pointers for creating a soothing environment for your furry four-footers, as well as the basic techniques you’ll need to safely massage your companion animals. After watching this short episode, and a little bit of practice, you’ll be sending your pet kids off to a blissful state of relaxation. This holiday season, we’re especially pleased to bring you news of yet another financial award given by the Dr. Jane’s HealthyPetNet Foundation, this time to an inspirational organization of animal rescuers in Pennsylvania. First, though, we offer an important end-of-year message, which also provides context to illustrate the importance of this rescue’s work. Many Americans decide to celebrate the holiday season by adopting a companion animal. And, who can blame them? Few would deny the happiness that comes from hearing the pitter-patter of tiny, furry feet through the house, or the genuine emotion of being on the receiving end of adoring gazes from puppies and kittens. It probably comes as no surprise that holiday adoptions are often decided on the spur of the moment. Pet stores are well aware of this … they cater to our expectations for convenience and are commonly located no further than the local strip mall. While the proverbial “doggie in the window” may tug at the heartstrings, many potential adopters fail to realize that often the creatures offered by these businesses import their dogs and cats from “pet mills”.